"Hmmm, let's see here where is it?" =/ Orihime says to herself with a finger tapping her chin, ooking though a list they had on the walls of all the species listed. Soon, she finds what she was looking for, "Aha, here we go. Par-al-itit-an." =3 she says, trying to pronounce the name, Paralitian, but almost gotting it right. But she knew that was the species she was looking for. "->SPECIES CONFIRMED. PARALITITAN. SEARCHING ARCHIVES....<-" The drone soon stated before it began to scan it's memory & data base once more to see if they had what Orihime was hoping to buy. & once again, it's eyes flashed green. "->MATCH FOUND. QUANTITY- 1<-"
"Ahh, it seems you've struck with luck, my dear." Cornelius then said. "Hahaha, awesome!" X3 Orihime says in excitement when she heard there was one Paralititan avaliable for her. With that, both Cornelius & the drone began to wander inside some of the holding pens in which held the available dinosaurs in the Coliseum for purchase. They began to search with Orihime to see if they could find this single Paralititan. Orihime looked around each of the enclosures for this one Paralititan. Suddenlly, the ground began to shake from large footstps! O.O Orihime hears this & rushes over to an enclosure, "I think I found it!" 83 she says as she looks up at a large adult female Paralititan walking towards a tree to browse from! O_O Orihime was then taken by the size of the massive sauropod, "Wow! It's BIG!" 8O she says. Cornelius & the single drone stood with Orihime. As the prime minister looked up to watch the giant sauropod eat from the top of the tree. He then turned back to Orihime herself. "So, is this the one, you think?" he then asked. "Yeah, this is the one for me." ;3 Orihime says with a wink. The massive herbivore turns its head to see both Orihime, Cornelius, & the android. It soon begins to slowlly walk towards them to investegate. With the drone standing beside him, Cornelius soon looked up to see the massive Parilititan approaching them. He then turns to the drone itself, giving it the order to prepare it's release for Orihime. O.O "W-wait a minute? You're gonna release it?" Orihime asks in confusion, "B-but what if it rampages & tramples the city?" o~o she says, fearing that might happen, wich it wouldn't. "Nonsense." Cornelius soon stated to Orihime. "It's perfectly safe. We have guards ready to detain any escaped dinosaur if necessary. & besides, something this large wont be going anywhere." he said, before turning to the drone & having it prepare for the dinosaurs release. The drone meanwhile went over to the controls for the gates. Switching the controls on & operating the sytems to the enclosures themselves, it soon activated the gates of the enclosure where the Paralititan was kept in & thus opened them to release the dinosaur. 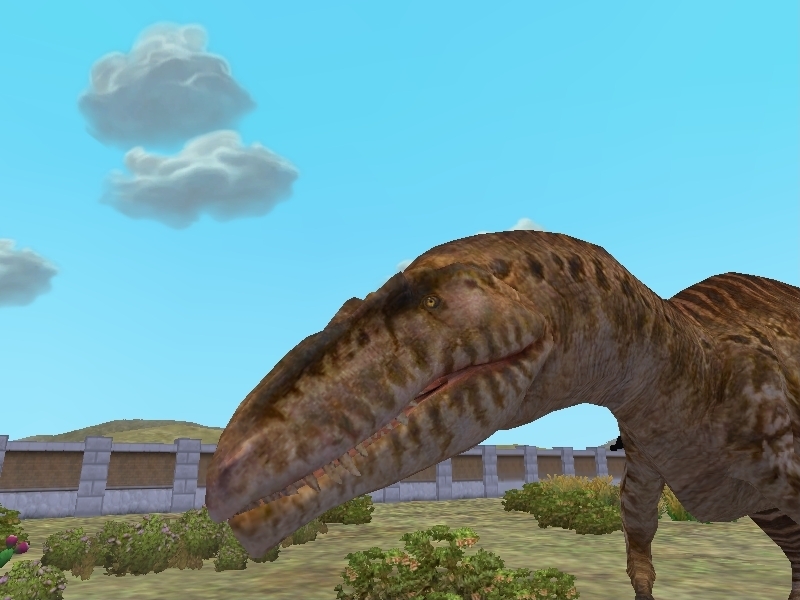 Orihime watched as she saw the door to the Paralititan enclosure opening up to release Orihime's new sauropod. But when the massive, multi ton herbivore went to exit it's cage, a terryfying roar was heard that mae the animal stay in it's cage as it was frightened by such a noise, recognizing the roar! But that roar was followed by another similar roar! O.O Orihime hears this & looks to the enclosure next door, wich is where the roars were heard, "What on earth-?!" she says. Unaware to her, these were 2 theropods living next door! Cornelius, standing beside Orihime, had also heard the sudden roar of what appeared to be two enormous theropod dinosaurs. "Ah.....So they are up & around after all." he soon said, looking on at the direction of the roars & where they came from. For this was a pair......of Giganotosaurus! Cornelius followed Orihime close behind. Before he himself arrived near the same enclosure to see the two giant Giganotosaurs. The two brothers. "These are two Gigantotosaurs." he said to her. "Both are brothers. My master has kept them for some time in the hopes of later possibilities." "Ahh, but they are perfect for the battlefield. They're the master's favorite type of dinosaur. He personally saw to it that more were producded for his needs." Cornelius soon said back, as he looked on at the two Giganotosaurs. The larger brother then began to sniff Orihime as she giggles a bit nervouslly, "Heh...hehe...h-h-hello, there." <83 she says, looking up at the massive predator, petting it's nose. Seeing this, Cornelius simply watched as Orihime petted the giant dinosaurs nose. 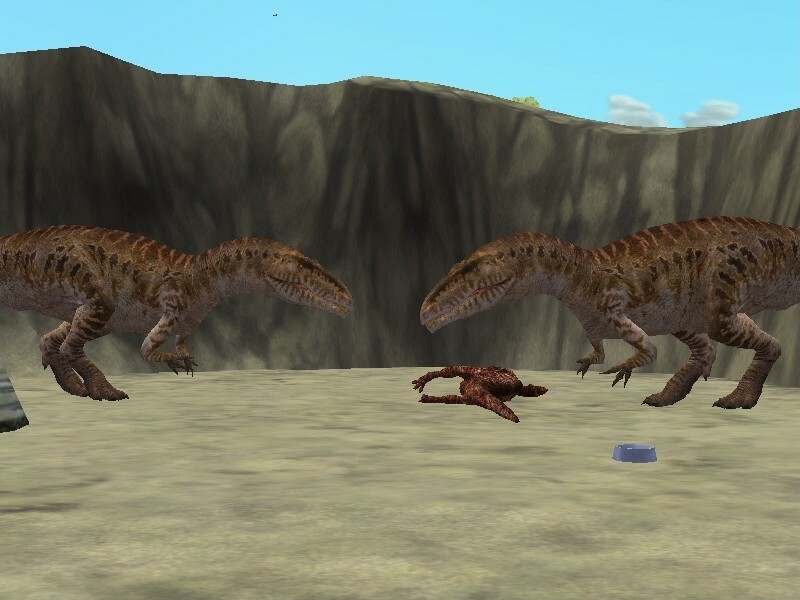 But eventually, he himself approached, unaware of how the Giganotosaur would react to him. But he assumed it wouldn't be too pleasant. "Now dear, don't get too close. These are still dangerous beasts. They can be unpredictable sometimes." "I know." 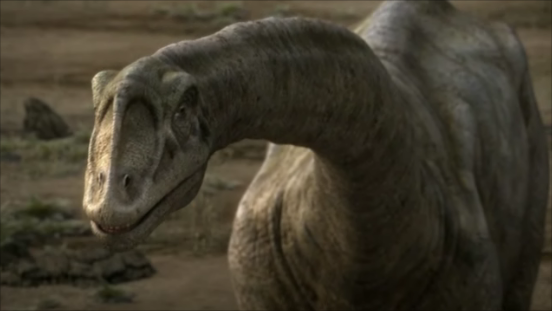 <X3 Orihime says as she stayed at a good distance from the theropod, who looks over & sees Cornelius, recognizing him. He gave a light growl before he turned to return to his brother. Cornelius stood where he was, still & beside Orihime as he watched the dinosaur return to his brother's side. He was slightly surprised that the dinosaur did not react the way he expected it to. As aggressive, rather then a mere grunt & growl. The brother had just woken up, wich meant he couldn't fully recognizing cornelius. If he was fully awake, then he would be a bit agressive towards the Prime Minister. The other brother, on the other hand, was different! He had been awake for about an hour now. He walked up to look at the group & gave a menacing growl & a small roar at them, mainlly at Cornelius! O~O Orihime backed up from hearing the other brother's growl & roar!